The Ladies' Paradise, originally "Au Bonheur des Dames," is the eleventh novel of the famous Rougon-Macquart (1871-1893) series of twenty novels written by mile Zola. It tells a rags-to-riches story about Denise Baudu, a poor young girl from the provinces, and Octave Mouret, the wealthy owner of the department store where Denise comes to work. The rise of the modern department store in late nineteenth-century Paris, the store as a symbol of capitalism of the modern city, and the bourgeois revolution tell us a fascinating story of love and ambition, while depicting a rich texture of Parisian society. Part of the project Immortal Literature Series of classic literature, this is a new edition of the classic work published in 1886 - not a facsimile reprint. Obvious typographical errors have been carefully corrected and the entire text has been reset and redesigned to enhance readability. About the Author: mile Fran ois Zola (1840-1902) was a journalist, a novelist, a playwright, and a political activist. He was one of the most influential French novelists of the 19th century and the founder of the literary and theatrical school of naturalism. Zola was a major figure in the political liberalization of France. mile Zola's works include novels, dramas, poetry, and criticism, among which is his famous Rougon-Macquart (1871-1893), a cycle of twenty novels which depict various aspects of life and society, such as "L'Assommoir" (1877), the seventh novel of the series, about the suffering of the Parisian working-class; "Nana" (1880), the ninth installment, which deals with prostitution; "Pot-Bouille" (1882), the tenth novel, and Zola's most sarcastic satire, which describes daily life in a newly constructed block of flats in late nineteenth-century Paris; and "Germinal" (1885), the thirteenth novel in the series, which depicts the mining industry and is considered by some as one of his masterpieces. "The Ladies Paradise," originally "Au Bonheur des Dames," one of his most relevant works, was the eleventh novel of the cycle. Zola's open letter to French president F lix Faure, under the headline J'Accuse... , published on the front page of the newspaper L'Aurore on January 13, 1898, charging various French officials with a "terrible miscarriage of justice," reopened the case of the Jewish army officer, Captain Alfred Dreyfus, who had been sentenced to Devil's Island. For that, Zola was himself sentenced to a year in prison but fled to England, returning one year later after Dreyfus' name had been cleared. Dreyfus was eventually reinstated as an officer and publicly decorated with the Legion of Honor. Emile Francois Zola (1840-1902) was a journalist, a novelist, a playwright, and a political activist. He was one of the most influential French novelists of the 19th century and the founder of the literary and theatrical school of naturalism. Zola was a major figure in the political liberalization of France. Emile Zola's works include novels, dramas, poetry, and criticism, among which is his famous Rougon-Macquart (1871-1893), a cycle of twenty novels which depict various aspects of life and society, such as "L'Assommoir" (1877), the seventh novel of the series, about the suffering of the Parisian working-class; "Nana" (1880), the ninth installment, which deals with prostitution; "Pot-Bouille" (1882), the tenth novel, and Zola's most sarcastic satire, which describes daily life in a newly constructed block of flats in late nineteenth-century Paris; and "Germinal" (1885), the thirteenth novel in the series, which depicts the mining industry and is considered by some as one of his masterpieces. 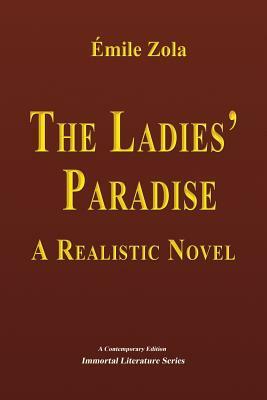 "The Ladies Paradise," originally "Au Bonheur des Dames," one of his most relevant works, was the eleventh novel of the cycle. Zola's open letter to French president Felix Faure, under the headline J'Accuse...!, published on the front page of the newspaper L'Aurore on January 13, 1898, charging various French officials with a "terrible miscarriage of justice," reopened the case of the Jewish army officer, Captain Alfred Dreyfus, who had been sentenced to Devil's Island. For that, Zola was himself sentenced to a year in prison but fled to England, returning one year later after Dreyfus' name had been cleared. Dreyfus was eventually reinstated as an officer and publicly decorated with the Legion of Honor.